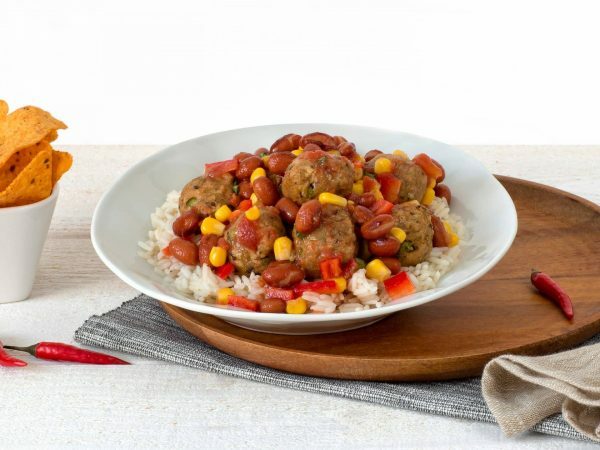 The Bean Balls Chili are deliciously spicy and full of vegetables. Suitable for a warm meal or as a snack during drinks. One vegan Bean Ball Chili weighs 17 grams and does not contain any milk or egg. This makes this product suitable for vegans. 37% beans (brown bean, broad bean), vegetables (pea, onion, bell pepper), water, 10% vegetable protein (wheat gluten), sunflower oil, starch (potato, wheat), wheat fiber, tomato puree, spices, thickener 9E461), salt, psyllium, 0,3% chili pepper, mineral (ferrous fumarate), vitamine B12. Produced in a facility that processes peanuts and nuts. Frying pan: 4-6 minutes on moderate heat. Turn regularly. Oven: 10 minutes at 180°C. Turn once. Barbecue or grill: Rub with (olive) oil. Grill on both sides for 2 minutes.